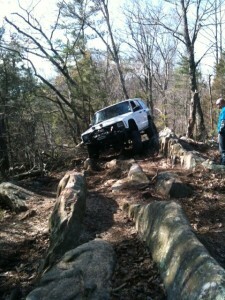 The Old Cumberland Trail is a new trail that we helped cut in at the Coal Creek OHV area in Oliver Springs, TN. This trail was in the making for about a year and a half. Recently it was finished with the help of the Atomic City Fourwheelers and Rattlerock 4wd Club. If you’ve ever been to the Coal Creek area you know that there are many levels of trails ranging from gravel road to difficult. The area is about 72,000 acres and is ever changing with the mining in the area as well as erosion prevention. Some trails get closed and the reopened, and then some get closed and new formed. This new trail is located just off of Walden Ridge Rd. at the crest of the ridge. This area of Coal Creek has never been used for OHV use until now. There are several obstacles along the trail and a great view throughout. 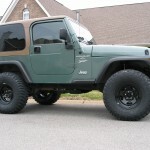 I would recommend that 33″ or larger tires be used on the trail and a winch mandatory. I’ve attached a video to give you a taste of what to expect when you tackle this trail. The TJ spent the early part of it’s life in Chicago so the rust really slowed down the install. The transmission skid had spun a nutsert that had to be drilled out. A flanged nut was then welded in place for a better than factory attachment. The lower control arm bolts had rusted and become one with the bushing sleeves of the lower arms. Those arms were destroyed with the red wrench just to get it apart. And, finally the track bar lower bolt had also rusted to the track bar bushing sleeve which required complete removal of the lower track bar mount. Thankfully, Rubicon Express makes the RE9989 replacement bracket. Since this had to be welded on, it was moved 1/2″ closer to the driver side of the axle to compensate for the offset that the 3″ lift creates (stock track bar was reused).